NEW YORK CITY — Veterans groups that have clashed with Mayor Bill de Blasio during the first two years of his administration are hoping a City Council plan to turn the Mayor's Office of Veteran's Affairs into a full-fledged city agency will improve their troubled relationship with City Hall. De Blasio reversed his longstanding opposition to a plan to give veterans their own city agency with its own budget — sending out an announcement Wednesday night that City Hall had signed on to a council bid to create a stand-alone Department of Veterans Services. “The brave men and women who put their lives on the line to protect us deserve access to every opportunity, and we look forward to continuing our support through this new city agency," de Blasio and Veterans Affairs Commissioner Loree Sutton said in a joint statement. The legislation makes New York the largest municipality in the country to have a city agency dedicated solely to veterans. Sources say the council had enough votes to override what could have been a de Blasio veto, forcing the mayor's hand. De Blasio had actively opposed legislation pending for two years by Queens Councilman Eric Ulrich, chairman of the Veterans Committee, who pushed for the agency to be formed and secured the support of Council Speaker Melissa Mark-Viverito and others. "We believe that by elevating MOVA to the department level, the city will be in a better position to deliver more resources and services to veterans throughout the five boroughs," Ulrich and Mark-Viverito said in their statement. Veterans groups had high hopes for de Blasio prior to his taking office, citing his frequent speeches about how his father had half his leg blown off while fighting in World War II. Many veterans said they felt de Blasio's family experience meant he understood them. But the mayor quickly ran afoul of some veterans groups by failing to quickly appoint a head of the Mayor's office of Veterans Affairs while not supporting city legislation to create a stand-alone agency. De Blasio also initially opposed state legislation that would allow veterans of Afghanistan to add their war service time to help calculate their pensions. And then there were procedural goofs such as failing to fly the POW-MIA flag to honor missing and captured soldiers at City Hall for more than a year, which de Blasio called a "stupid mistake." 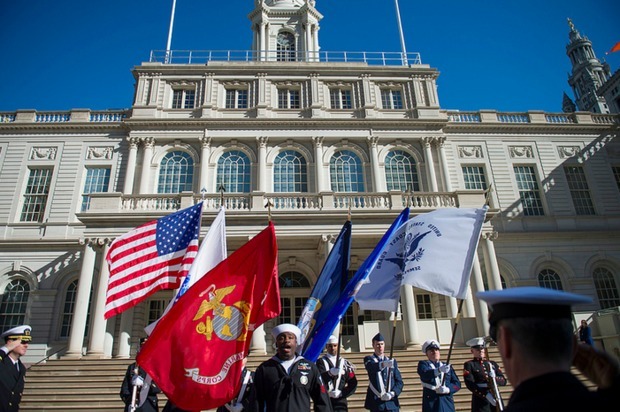 Veterans groups called de Blasio "tone-deaf" and protested on the steps of City Hall. In spite of the fact that the council likely forced de Blasio's hand, veterans groups say the new department could reset their relationship with the mayor. There are currently approximately 225,000 veterans in New York City. "Its a win for everybody," said Joe Bello, a Gulf War veteran and the founder of NY MetroVets. "You have to give the mayor credit because politics being politics, the bill being passed was not inevitable, especially if he lobbied against it by siphoning a few votes here and a few votes there," Bello added. Paul Rieckhoff, founder and CEO of Iraq and Afghanistan Veterans of America, said he hoped the move ends what has been an unexpectedly contentious relationship between veterans and City Hall. “For the last two years, the mayor has repeatedly turned down any opportunity to engage effectively with...the veterans community," Rieckhoff said in a statement. "We hope this disengagement and opposition is a thing of the past and that today signals a new day for the mayor and the veterans of New York City." Kristen Rouse, executive director of the NYC Veterans Alliance, had a chance to pitch de Blasio in meetings Wednesday on the idea of a stand-alone veterans agency. She said she was unsure of whether her pitch made a difference because she had been openly critical of the administration. "He smiled, and was very kind and listened to me. He didn’t state a position," said Rouse, an Army veteran who served three tours in Afghanistan, on her interaction with de Blasio. "I said that we hoped he would be the best mayor in the country for veterans." Bello, who said he became emotional when he heard the news about the legislation, said the city still has many veteran issues to tackle including ending veteran homelessness, increasing the awards of city contracts to veteran-owned businesses and improving street vending licenses for veterans. "Is there still work to be done? Yes. But anybody who has any problems with the mayor from the veteran community right now doesn't have a base to stand on," said Bello.